Björk’s schedule is so hectic that you can only pin her down for a chat mere hours before the conversation happens. Once you do, though, it’s like channelling an oracle. This is Björk, after all: over the course of four decades the Icelandic artist has changed our understanding of what music can be. Her nine solo albums have translated into tours of extraordinary multi-sensory, multimedia wonder. Meanwhile, her cultural reference points are so broad that she’s collaborated with everyone from Inuit throat singer Tanya Tagaq to David Attenborough. Even Steve Coogan. The lyrics on ‘Blissing Me’ are about sending someone MP3s and falling in love to a song. How often do you send people MP3s? 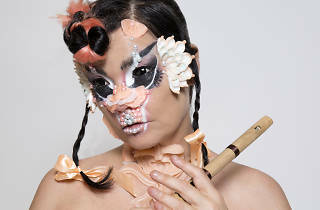 Björk plays All Points East on May 27.